Quiz: How Well Do You Know The Aristocats? “Marie: Me first! Me first! Toulouse: Why should you be first? Marie: Because I’m a lady. That’s why. Toulouse: Oh, you’re not a lady. 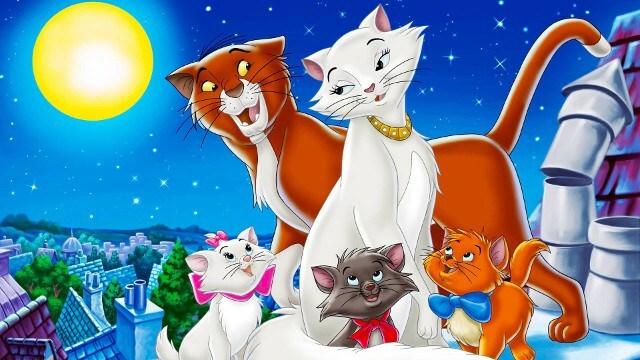 The classic Walt Disney animated film The Aristocats, tells the story of a family of aristocratic cats, and an ally cat who helps being kidnapped by their evil butler. The Aristocats is full of musical numbers, witty one liners, and touching moments that are sure to please viewers of every age. Take this fun quiz and test your knowledge of Walt Disney’s: The Aristocats! How Well Do You Know The Aristocats? What year was Walt Disney’s animated film The Aristocats released? In Walt Disney’s The Aristocats, how many kittens did Duchess have? In Walt Disney’s The Aristocats, what is the girl kitten’s name who is white and wears a big pink bow around her neck? What is the name of the ally cat who offers to guide Duchess and her kittens thru Paris in The Aristocats? What is the name of the trumpet playing, jazz loving feline who offers to give the group a place to stay for the night in Paris? In The Aristocats, what city does Edgar attempt to mail the kittens to? The cats meet a pair of geese, Abigail and Amelia, on their journey in the movie The Aristocats. What is the name of the pair’s uncle? In The Aristocats, what does Thomas say that Duchess’s eyes are like? What is the name of the helpful horse in The Aristocats? Leaderboard: How Well Do You Know The Aristocats? Acamm is one of our contributors to D-COT. She helps provide fun and exciting quizzes every week for you to enjoy! Check out our social media pages to see some of her posts too. Quiz: How well do you know Cinderella, the classic animated Disney film? Test Your Knowledge of the Current 2019 Walt Disney World Restaurants as described on the Official Walt Disney World Website! I think I need to rewatch The Aristocats now! Haha – can we tell this is one of my daughters’ favorite movies and I’ve seen it dozens of times…? Damn, swinging cat. My DD loved this movie and watched it every day for about 2 years. The tape wore out. We named one of our cats Jazz because of this movie. whoo hoo! It’s been like 10 years since I’ve seen this movie, but heck I must have one hell of a memory! 80% Not bad at all, i’ll take it! I’ve not seen the film in about 20 years! The Swan’s Uncle IS called Waldo. D-CoT © 2019. D-CoT.com is not affiliated with The Walt Disney Company. All Disney films, characters, theme parks, attractions, names, etc. are registered trademarks and/or copyrights of The Walt Disney Company and/or its subsidiaries and/or affiliates. In no instance does D-CoT.com imply ownership and/or interest in any of the copyrighted/trademarked/intellectual property rights affiliated with The Walt Disney Company and/or their subsidiaries and/or affiliates. D-CoT serves the purpose of a fan site only and is a production of MixxCreative LLC.